All our commercial architectural millwork packages are quoted based on the scope of work indicated by our customer. If you have a smaller scale project we are also very interested in helping you achieve your goals. Our general shop labor rate is $85.00 per hour. For our 42″ wide belt sander our hourly rate is $110.00 with a $55.00 minimum charge, and our CNC cutting rate is $110.00 per hour. Please contact us to discuss your ideas and receive a quote on your project. Our 42″ wide belt sander. We are continuously processing all different size woodworking projects. Sometimes a customer needs us to sand a counter or table top blank. Other times customers want us to cut all their sheet goods to size for them. We also do several molding packages where we will take our lumber and mill it into custom matching trim for historical restoration jobs. If your needs deal with wood, we can help you. The following are just some of the services we can perform for you. We have a wide range of abilities. If you do not see your needs listed, please contact us to discuss how we can help you. CNC Cutting: Accurate and efficient cutting of parts on our Biesse Overhead Router with a 5′ x 12′ table. Machining parts: Cabinet Doors, Drawer Boxes, etc. 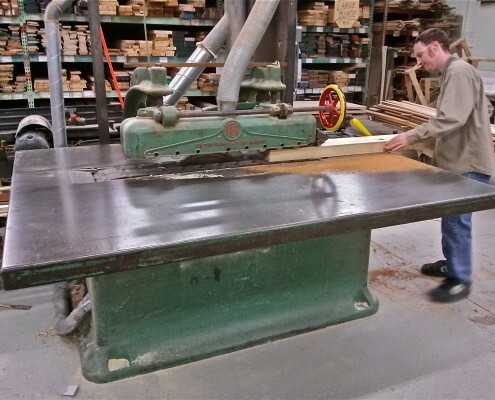 Sanding: Our wide belt sander has a capacity up to 6″ thick and 42″ wide. Glue-Ups: Our mill produces hundreds of custom glue-ups each year, from work benches to wood kitchen counter tops and raised panels for doors. Finishing: We offer custom finishing in our finishing department. However, we are not a re-finishing company and do not provide finish striping services. Sharpening: Every Tuesday we send out knives for jointers and planers, saw blades and router bits for sharpening and they are returned the next Tuesday. 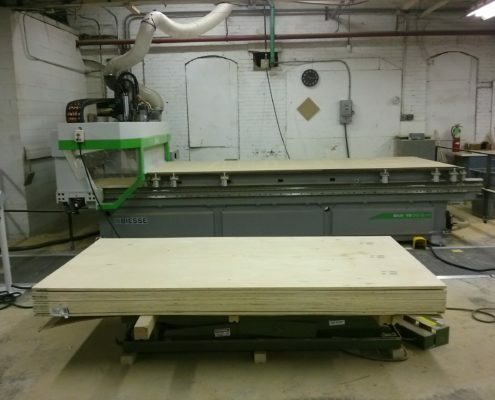 Resawing: we have a 14″ capacity on our band saw. Jointing: Our jointer can face a board up to 20″ wide. This is a great benefit for those who must have true flat and square lumber. Thickness planing: Our planer will handle material up to 24″ wide. Laminating: Custom plastic laminate work for counters and casework as well as solid surface counter tops and panels. Our straight line rip saw can rip lumber up to 4″ thick. The caterpillar track in the table pulls the lumber straight through the ripping blade giving us a straight edge that can be glued. This saw is fast and efficient making quick work of your cut list. 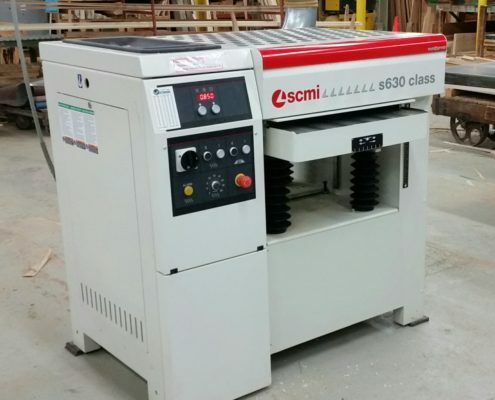 Our SCMI 24″ wide thickness planer. It is much quieter than our previous planer and it provides a nicer finish to your boards. Our Biesse Over Head Router CNC with a 5′ x 12′ table adds greatly to our machining ability for the custom work we do for our customers. We can cut our any shape from rounds to rectangles and triangles. In addition to cutting unlimited shapes, we can also bore holes in parts for shelf pins, hinges, and drawer slide screw holes. With a bit of additional engineering for these processes, we can produce and assemble with more accuracy and efficiency. Contact us for your next project.